Kia’s new Niro is an attempt to transplant the heart of an economical hybrid into the body of a fashionable crossover, to try to combine the merits of both breeds. The surgery has been a reasonable success – I’m happy to report it’s not a shambling Frankenstein’s monster. But the Niro is not quite the best of both worlds either. It’s not as frugal as it might be if it were a more sleek and slippery shape, like a Prius. And I wouldn’t advise taking the styling at face value and venturing up any muddy tracks, hoping that this new Kia might have some off-road skills up its arches. This is a strictly front-wheel drive beast. 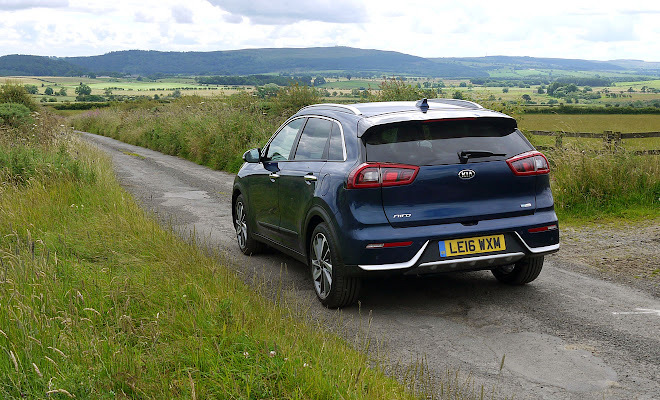 However, what the Niro does provide is engaging enough. 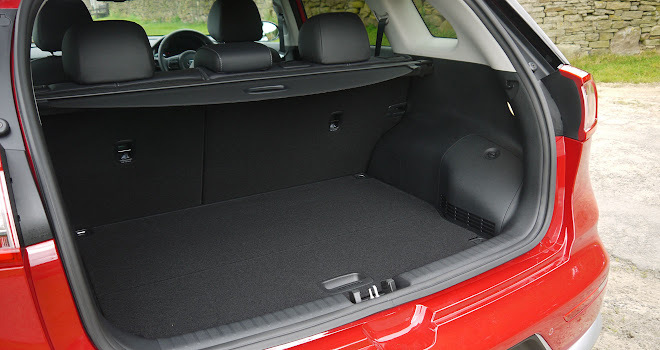 It’s comfortable and reasonably spacious and should be kinder to the air than a diesel softroader. The most natural alternative is probably a 1.5-litre diesel Nissan Qashqai, which is about the same size, shape and price but with a greater tendency to emit nasty NOx and particulate pollution. The likelihood of matching diesel levels of economy will depend on which Niro model you choose. There are four trim levels, numbered from 1 to 3 plus a range-topping First Edition, and the two lower-spec models ought to prove the most economical. Not because they are slower or less powerful, but because they have 16-inch alloys fitted with energy saver tyres. The two higher trim levels arrive with wider, lower-profile, sport-biased tyres on 18-inch alloys. The bigger wheels create a lot of extra road roar at speed, feel clod-hopping over bumps and will probably cost you about 10mpg, if my test drives are any guide. The best I could squeeze out of a Niro First Edition was just under 54mpg. I then drove a cheaper Niro 2, on comparable roads, and managed almost 64mpg. A similar story is told by the official figures, which put the combined cycle economy results at 64.2mpg and 74.3mpg for the small and large wheels respectively. The corresponding CO2 ratings are 88g/km and 101g/km. 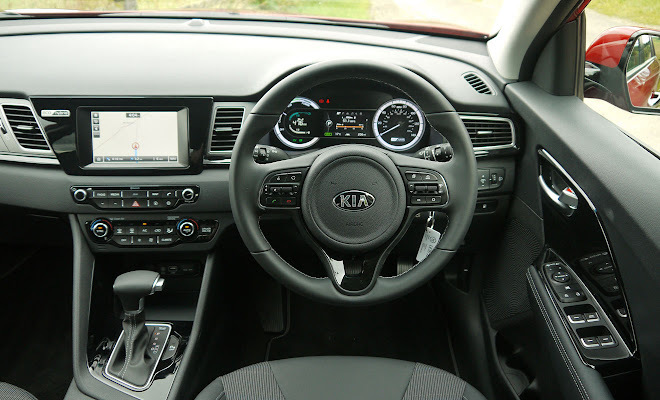 Kia would be well advised to offer a wheel downgrade option for buyers who want all the features of the top trim levels without the 18-inch wheels. The bigger alloys might look good but that’s about all I can say in their favour. Prices for the four trim levels run from £21,295 to £26,995. Whichever level you choose, the Niro will come out as a fairly generic looking vehicle. 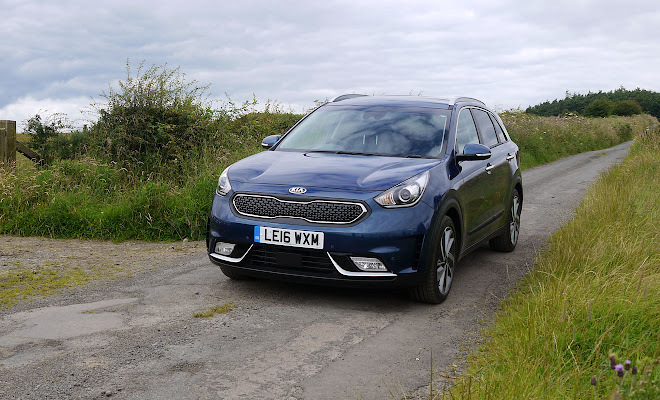 It’s hard to point at any particular feature and call it distinctive, though with basically sound proportions the new Kia is far from ungainly. It lacks the overt muscular bulges of the Qashqai, though some well-judged sculpting of the sides and wheelarches does hint at inner strength. The side view, in bright light, is the Niro’s best angle. Beneath the surface there is some substance too – Kia has used a lot of high-strength steel in the car’s core, to try to bring weight down and economy up. Similarly, swing the tailgate shut and you’ll be struck by how light it feels – because it’s made of aluminium. The hybrid innards are pretty clever too. All variants of the Niro employ a 1.6-litre petrol engine providing up to 104bhp, aided by a 32kW (43bhp) electric motor. Motor and engine can co-operate or act separately to drive the front wheels. The combined output of engine and motor peaks at 140bhp, with a maximum 265Nm of torque. The electric motor is integrated into the six-speed, dual-clutch automatic gearbox – in common with most other hybrids, there’s no option to choose a manual Niro. The gearbox shifts smoothly and quickly when left to its own devices, in eco mode. Alternatively, nudge the chunky T-shaped gearstick into a clutchless manual slot, activating sports mode. This also makes the throttle more lively, which feels distinctly out of character for what is a fairly easy-going vehicle. Back in eco mode, when setting off or manoeuvring at low speed, the Niro will tend to leave the engine switched off and rely on its electric motor alone. From inside this kind of movement happens in eerie silence, while on the outside an electronic warning hum tries to prevent the Niro creeping up unannounced. The relatively small 1.56kWh lithium polymer battery gets all its charge through regenerative braking – a plug-in hybrid Niro is not due till next year – which means that electric running soon gives way to hybrid mode. The engine will quietly and smoothly switch itself on and off as the need arises. There’s no rev counter, but ask for urgent acceleration and you’ll hear the engine note rise, as the gearbox delays its upshifts to provide the necessary power. Braking is initially soft – alarmingly so at first brush – but there is plenty of stopping power once you push the pedal a bit harder. The pillowy initial feel presumably helps to encourage efficient regenerative braking rather than heating up the brake discs. There is no handbrake, by the way. The parking brake is engaged or released using a US-style foot pedal. Hill starts are simply a matter of moving your foot from brake to throttle. There is a notable lack of engine braking when you step off the throttle again. 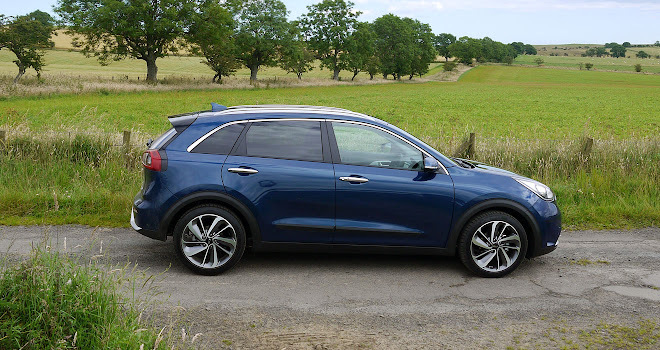 The Niro is basically set up to glide along on its own momentum, to save fuel, with the engine physically disconnected from the wheels when slowing down. Regenerative braking is minimal until you choose to press the brake. The feeling of coasting can come as a surprise the first time you leave a fast road or approach a junction in the Niro, but it’s easy enough to adapt what you do with the pedals. In other respects the new Kia feels remarkably unremarkable. 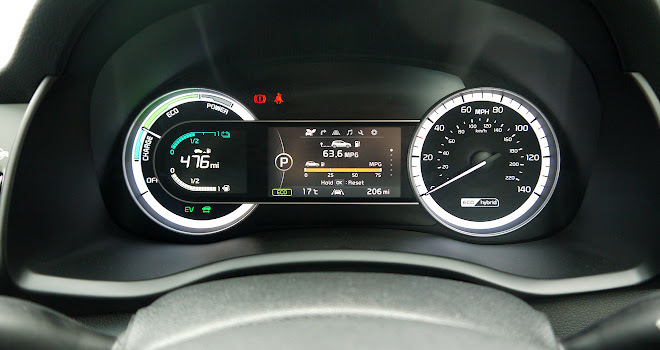 The engine noises and gearbox shifts make acceleration much more natural than the seamless, disconnected impression conveyed by the Prius’s continuously variable transmission, although Toyota would doubtless argue that its approach is more efficient. The battery is bolted under the rear seating, alongside the petrol tank, giving the Niro a big and well-shaped boot. There’s no spare wheel under the relatively high-set floor, however – it has been ditched to save weight. Talking of which, at 1,500kg the Niro is no lightweight. A diesel Qashqai is 135kg lighter – roughly the weight of a couple of people – while the current generation Prius weighs at least 100kg less. The Niro’s interior pretty much matches the outside, with little to surprise or delight but not much to complain about either. If pressed I’d say the door mirror controls seemed unnecessarily large and clunky. 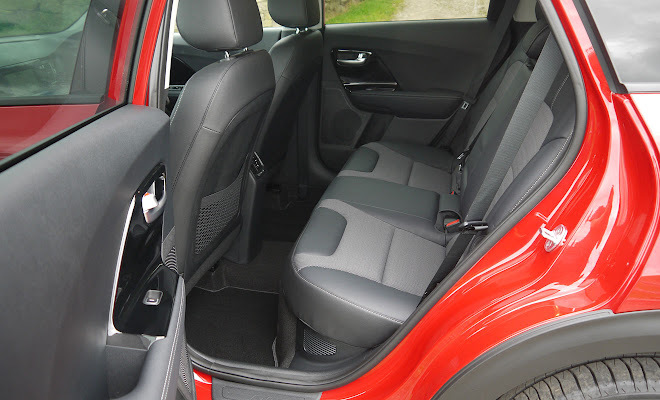 Plastics below elbow level are pretty low rent, while the textures chosen for the softer plastics nearer your eyeline look old fashioned, squandering the opportunity to affirm that the Niro is a high-tech, state-of-the-art car. 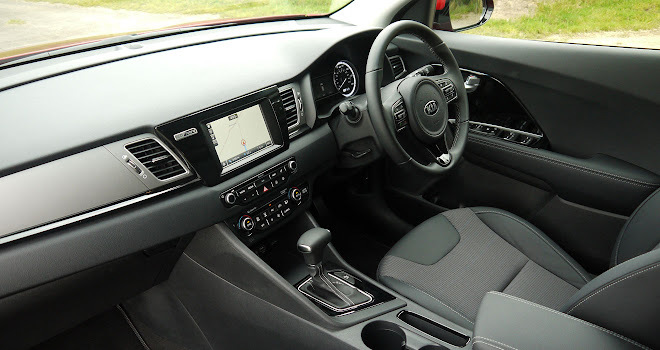 Jump from a Citroen C4 Cactus into a Niro and you’ll wonder what a Kia interior designer does all day. Trim levels 2 and above get a touchscreen satnav with reversing camera, while even the base model Niro gets a digital information screen in the centre of the instrument panel. One neat feature is the way this little screen confirms your actions – twist the lighting stalk to auto, say, and the screen will flash up a message confirming that the lights are now set to auto. It makes you wonder why other cars aren’t so helpful. Equally welcome is a seven-year, 100,000-mile warranty – though fears that hybrid batteries won’t last the course are, hopefully, no longer prevalent in a world of mega-mileage hybrid minicabs. Three- and five-year fixed price servicing packages are also available. The name Niro rhymes with hero rather than biro. 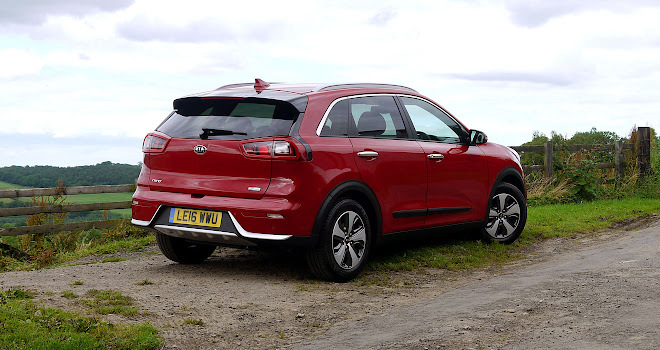 And indeed the new Kia is not quite a hero, more a dependable supporting character. It’s not bold or flashy, but it is solid and likeable, and ought to provide good value. Just think twice before opting for big wheels.